Although there are too few movies out there with women of color at the top of the marquee, the way to successfully address this situation isn't by taking an established concept, applying a gender-reversal, and creating an inferior production. 2000's What Women Want was by no means a perfect film. In fact, it was guilty of taking a rich premise and strip mining it for quick laughs and fantasy-fulfillment while leaving a host of intriguing possibilities behind. However, instead of reclaiming some of the lost potential, What Men Want does a worse job with the core idea than its predecessor. At least What Women Want could be identified as an enjoyable rom-com with a dose of female empowerment. One would have to be charitable to use "romantic", "comedy", or "enjoyable" for this new iteration. Diminishing the importance of the love story from a key element to a throw-way subplot allows director Adam Shankman to fully focus on the theme of gender equality. Unfortunately, the film's approach feels outdated, hearkening back to how the subject was broached in the '80s, when the concept of a woman thriving in a "man's world" was sometimes deemed revolutionary. In What Men Want, everything is strident and exaggerated - most of the men are chauvinist ogres who would never think of allowing a woman into their all-boys' club. Consequently, the character arc for Ali Davis (Taraji P. Henson) isn't as much internal, as it was for Mel Gibson's character in What Women Want, as external. It's about beating the guys at their own game, achieving parity, then using that position to kick them in the nuts. Ali is a top agent at one of Atlanta's premiere sports agencies. (Cue a landslide of cameos.) She's a ball-buster with a long list of A-clients. Her nebbish (and gay) assistant, Brandon (Josh Brener, doing his best Rick Moranis impersonation), is thoroughly cowed. When the time arrives for one of the workers to be promoted to partner, Ali thinks she's a lock. But the key doesn't fit and the position goes to a less-deserving knuckle-dragger. A furious Ali confronts her boss, Nick (Brian Bosworth), who admits there's at least one person in the firm who doesn't want a woman partner. Plus, she doesn't represent any NFL, NBA, or MLB stars. He advises her to "stay in her lane." Looking to blow off some steam, Ali engages in a few days of what might be considered "risky behavior": a one-night stand with a bartender (Aldis Hodge), imbibing an herbal "tea" brewed by a psychic (Erykah Badu), and overindulging in alcohol. There's an accident, she hits her head, and when she wakes up in the hospital, she can hear men's thoughts. At first, this freaks her out, but she eventually learns to see this as a blessing, providing a route to the top by signing potential #1 NBA draft pick Jamal Barry (Shane Paul McGhie) despite the interference of his helicopter father, Joe "Dolla" (Tracy Morgan). Taraji P. Henson's performance falls into the "force of nature" category, making her one of the few things worth watching. She navigates the character's feeble arc effectively, gradually softening Ali's edges as she starts to see herself through the eyes of others. As her faithful assistant, Josh Brener is called upon to dredge up most of the typical gay stereotypes - it's an unfortunate portrayal. The producers would argue that it's "positive" but the character is used more often than not for comic relief and recalls memories of how nerds were presented in '80s high school comedies. Shankman's recent bread-and-butter has been musicals - he directed Rock of Ages and Hairspray - and What Men Want could have used a little song-and-dance energy. Although no one would argue that Nancy Meyers' approach to What Women Want was subtle, the characters were more deeply realized and the romance added a dimension missing from this re-interpretation. For the most part, the comedy here is predictable and humorless - lines and jokes that get an audience's laugh-track accompaniment because they're supposed to be funny not because they actually are. As for the R-rating...this is a PG-13 movie with a lot of "f-bombs" thrown in to make it seem more "adult." Despite the latitude afforded by the restrictive classification, the filmmakers don't attempt anything edgy. 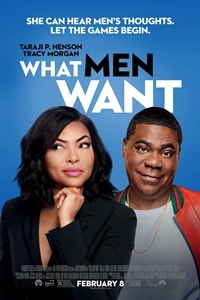 Bland and uninspired, What Men Want wastes its premise even more egregiously than its 2000 inspiration while offering little more than a sparkling Henson performance to distract us from the underwritten screenplay.